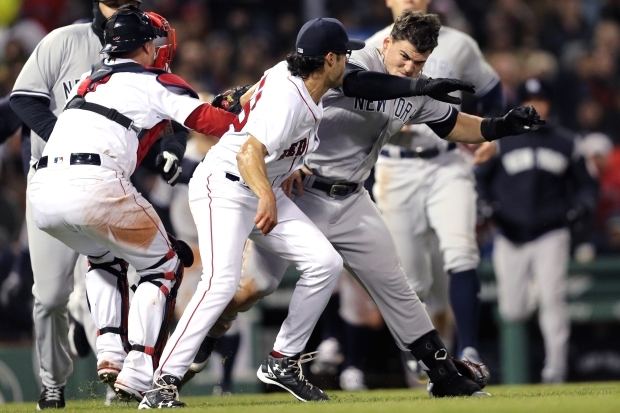 Boston Red Sox pitcher Joe Kelly received a six-game suspension from Major League Baseball on Thursday for his role in Wednesday night's bench-clearing brawl with the New York Yankees. Kelly hit New York's Tyler Austin - who was suspended for five games - with a pitch in the top of the seventh inning. Austin subsequently charged the mound, causing the benches to clear. Both players announced they would appeal their suspensions. Kelly hit Austin as retaliation for his slide into Red Sox shortstop Brock Holt in the third inning, when Austin spiked Holt's leg on a slide into second base. The benches cleared briefly during that incident as well after Holt and Austin exchanged words. Both Kelly and Austin were ejected from the game, as were Yankees' third base coach Phil Nevin and relief pitcher Tommy Kahnle after the seventh inning scuffle. The Yankees won Wednesday's game, 10-7, handing Boston its first loss since Opening Day. The teams complete their three-game series tonight at Fenway Park at 7:10 p.m.